This is the sort of article I wish I had found before heading to New Orleans for the Rock ‘n’ Roll New Orleans Marathon. Eating vegan in NOLA was going to be a challenge, and the info I found online was pretty scattered (and not recently written). The good news: It’s possible to eat vegan in New Orleans, but forget about anything that has any sort of Nawwlins flavor. The area with the best variety of vegan-friendly spots is fortunately also currently the trendiest area for live music: Frenchman street and the area of Faubourg Marigny. The neighborhood is adjacent to the French Quarter, so it’s super easy to get to. This small four-restaurant chain (no website) of casual middle-eastern restaurants has a location right on Frenchman street. The atmosphere is casual but spacious — tables aren’t on top of each other. Big windows let you watch passers-by. There’s also a small middle-eastern grocery where you can pick up pita, olives, dates, etc. The food was great on all four visits–even took take-out tabouleh on the plane. The menu: All your meat and non-meat middle-eastern standards are here. The felafel was very good. Hummus and baba ganoush are also good, with a dollop of green-chile hot sauce on top. The tabouleh is out of this world! Possibly the best I’ve ever had. Vegan awareness: The staff was knowledgeable and accommodating. They’d clearly dealt with vegans before, and could easily help navigate the menu. Another great vegan-friendly option, Sukho Thai is a stone’s throw from the French Quarter. It’s often recognized as the best thai in town. They serve meat, but they also have a whole page of vegan entrees. The restaurant is cute, with original art on the walls. Staff is super friendly. This is also a good spot for groups. The food was very good, but a little inconsistent. One night my “eggplant lover” veggie dish was spicy but not too hot; the second time, however, it was much spicier. Ask for “mild” and add extra spice if you like. The menu: There’s a whole page of about 12 vegan entrees, from noodle dishes to stir fries and curries. The sukiyaki, pad thai, dirty noodles and eggplant lover’s dishes were all excellent overall. Vegan awareness: As befitting a place with a vegan menu, the staff were knowledgeable and patient, and even could recommend items. On the downside, the chef was unwilling to say exactly what went into one of the sauces on the vegan menu, wanting to protect his recipe. This joint is primarily a bar, but they serve food too. The sign out front just says “13” and it’s right on Frenchman. Didn’t eat here, but did stop by and check the place out. They do have four vegetarian sandwiches on the menu, including a black-bean burger. Most can be made vegan by omitting the cheese and mayo, but they do have a veggie mayo they can substitute. You can also get breakfast all day, and they’ll make a tofu scramble or burrito (for an extra $1.00 — BOO). Didn’t try the food, but the bartender was knowledgeable about the menu and the place is small and cute, with most seats at the bar. Feelings Cafe, 2600 Chartres St. This adorable spot bills itself as the most romantic restaurant in New Orleans. Feelings Cafe serves dinner and Sunday brunch, and do have a separate vegan menu. Most of the items are tapas-type small plates that you can combine into a meal. There’s also a vegan pasta on the menu. Didn’t eat here, but kudos to anyplace with a separate vegan menu! The Garden District is great — beautiful, enormous mansions, the crumbling Lafayette Cemetery No. 1, and Magazine street, full of funky vintage shops. Because there’s a more bohemian vibe here, you’ve got a few vegan-friendly choices. This place is sort of a fancy middle eastern joint. The Byblos menu will look familiar. It’s mainly meat, but there are some veggie options. The food isn’t as good, nor are the portions as generous as Mona’s. The menu: Standard Mediterranean, with prices a good dollar or two higher than Mona’s. We tried the veggie wrap, which sadly was mainly lettuce, cucumber and tomato (we’d been told it included ‘lots’ of eggplant); and the felafel wrap, which was pretty standard. The tabouleh was terrible — clearly yesterday’s batch. When we noted this to the waiter, he offered no apology. Vegan awareness: On the day we were there, eh… not great. Not very friendly, nor very enthusiastic or helpful navigating the menu. Juan’s Flying Burrito, 2018 Magazine St. This mexican-ish place has a couple of additional locations. We didn’t get to visit or check it out, but the Juan’s Flying Burrito menu has a couple of solid non-dairy vegan-friendly options, including the Super Green Burrito. Slim Goodies Diner, 3322 Magazine St.
I’d really wanted to try this one, as the Slim Goodies menu says they’ll make any egg dish with tofu, they have soy bacon, and there’s breakfast served all day. But the overwhelming smell of cooking bacon and animal fat, drove us back out the front door. Please let me know if you tried this one! Vegans are pretty much out of luck in the French Quarter. Sadly, no restaurant seems to have tried to adapt creole cuisine for vegans, which is so sad. 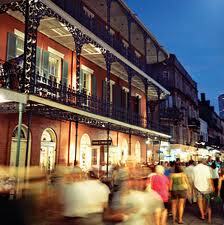 My recommendation is to head over across Esplanade to the Frenchman street area, which has more to offer. Bennachin is a small African restaurant that has a few items for vegans. Didn’t eat here, but it always seemed busy. All the vegetable dishes include some kind of thick sauce, so be sure to ask about dairy. Reviews online are mixed. Some vegans say they had a great meal here, but others found it very bland. This place was a real surprise. It’s mainly a take-out place that does Pakistani dishes, Indian food, po-boys, and even pizza. Clearly, they’re trying to cover all the late-night street-food basics. But we were pleasantly surprised. The cooks understood vegan requirements, and knew exactly which menu items were suitable. The menu: There’s plenty of meat on this menu, but a solid section with five or six vegan items. We tried the veggie samosas (good, but potato-heavy), chana masala and bhindi (okra) masala. Both were good, if a bit on the mushy side, but it was nice to have one more option in the French Quarter. Vegan awareness: Very friendly guys behind the counter who wanted to show us which pans they use for veggie items. Impressive for a place that’s basically take-out. This area, adjacent to the French Quarter, is home to the big banks and tall buildings in New Orleans. The warehouse district is right there too — an area with art galleries and museums. Carmo is a Caribbean-inspired restaurant that does a big lunch business. You order at the counter and they bring your food to you. The owner/chef said she wanted to create a place where meat-eaters and vegetarians could happily dine together. The menu: Items are labeled vegetarian, vegan and gluten-free. Many of the salads and sandwiches can be made as either meat or non-meat. The most popular sandwich, the “Rico” can be made with either pulled pork or a TVP product that’s smoked in-house (it was delicious). We also sampled the Carmo salad and the Esmerelda salad (both great). I tried a special on one visit, a vegan cassoulet that was very tasty. Coffee shop: All of the Community Coffee shops we visited had soy milk–good to know, and they are everywhere. Grocery store: There are no huge grocery stores in the French Quarter or Marigny areas, but there’s a good-sized neighborhood Rouses grocer at 701 Royal St. in the Quarter; this market carries several brands of soy milk and almond milk, plus a small produce section and refrigerator section with hummus and salsa. You could put together a decent vegan picnic. Vegan Korean coming soon? I kept reading about the Wandering Buddha, a fully VEGAN Korean eatery operating out of the back of the Hi-Lo bar on St. Claude Avenue. It closed on Jan. 30, 2013, unfortunately. However, their Facebook page says they’re searching for a new, larger location. This entry was posted in Food, Travel and tagged Vegan. Bookmark the permalink. 1 Response to Eating vegan in New Orleans: Not impossible! We are about 70 miles southeast of New Orleans, great list of some awesome restraurants.